This LCN 2031 is a concealed overhead track arm closer supplied with spring size 1 for use in ADA applications. Designed for use with interior and exterior doors that measure up to 36" wide. Track and arm are concealed in the top rail of the applications. This LCN 2033 is a concealed overhead track arm closer. Supplied with a size 3 spring that will accommodate interior doors from 34" to 38" wide and exterior doors from 28" to 30" wide. This closer is designed to fit in a narrow, minimum 1-3/4" x 4" aluminum transom. This LCN 2034 Pacer concealed overhead track arm closer is designed to fit interior doors measuring 38" to 48" wide and exterior doors measuring 30" to 36" wide. In applications where a strong draft exists, specify next size closer. 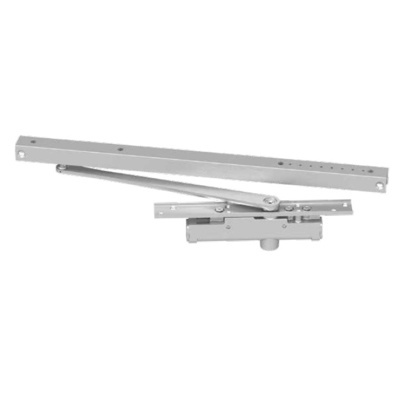 This LCN 2035 Pacer is a concealed overhead track arm closer with a size 5 spring for interior doors that measure from 48" to 54" in width and exterior doors that measure from 36" to 42" in width. This LCN 3033 is a standard duty concealed-in-door closer in which the c||ylinder is concealed in the top rail of the door and the arm is exposed on the hinge side of the door. Supplied with size 3 cast iron cylin||der for interior door width of 34" to 38". LCN - 3133 Concealed in DoorTrack Arm Door Closer for Interior doors. This LCN 3133 concealed in door track door closer is designed to mount in a 1-3/4" thick interior door. The single lever arm and roller assembly provides complete concealment. Spring size 3 for interior door 34" - 38" wide. LCN - 3133H-AL Concealed in Door Track Arm Door Closer with Hold Open for Interior doors. This LCN 5034-AL is a concealed overhead door closer for aluminum doors. Its size 4 spring will accommodate interior doors from 38" to 48" wide and exterior doors from 30" to 36" wide. The closing power of this closer may be increased by 50%. Overhead closers are a popular choice for doors in applications where aesthetics is a consideration and where floor closers are not an option. A complete overhead closer package includes everything you will need for a proper installation of the closer. These packages can also be customized to meet all your door’s requirements. A standard overhead closer package includes a closer body, mounting brackets, a cover plate, an arm package and a pivot. Many closers can also be customized with different options such as handing, hold-open, opening degrees, size and finish. Additionally all parts can be ordered separately as well. Each closer is designed to work with specific door materials and for doors that fit a certain category of use and abuse. Read our detailed description for each closer and closer part to help you find a closer that will best suit the needs of your application.